The moment I started thinking about the person who left a everlasting impression on my mind a flashback rolled in front of my eyes and I was in one of the darkest memories in my life where She was the women full of light and hope. The day when our precious and joyful time in the beautiful vicinity of Himachal Pradesh changes to a dreadful experience with heavy rains followed by landslide at Rohtang Pass. Its was 6 in the evening, getting dark everywhere and the powercut was making it more darker with every passing second. Blocked Roads, Heavy Rains, No Lights, No Mobile Connectivity, No Shelter, It was a shivering experience that shivered us to the soul. The feeling of being helpless at that moment rolled out as tears. Heavy rainfall block the hope of help reaching us. And suddenly A Women in her late 80’s reached us. With a rubber sheet over her we felt she is also sufferer of road block but to our suprise, she said “Come With Me ” and she lead us to a small Hut nearby. A Hut covered with rubber sheets seems itself is struggling in heavy rains. When we enter, it has almost 8-10 people inside including old lady’s son, daughter-in-law and half dozen of grandchildren. But the women with the small hut, is the biggest heart I ever met. She welcomed us inside, two more people in the hut seriously making it more congested but her smile don’t fade. She gave us a blanket, while guiding her grandchildren to one blanket and offered us food to eat. They all definitely ate few bite less to give us that much needed bites. Everyone did the way old lady guided, no one offended her. She sat by side while wiping my wet hairs with her saree she very calmly said, don’t worry it will be fine soon and you can stay here as long as rain stops and road opens. With last candle left she offered us a corner with a blanket and said Sleep before candle gets over and head to her grandchild to make him sleep. After having most silent sleep in the dreadful night when my eyes open with the sunrays falling on my eyes I saw her trying to lit up the stove with a combination of wet and dry wood pieces, with all preparation on morning meal done and everyone still fast asleep. In that dreadful evening she comes as a blessing to us who if not offered us shelter and food, we might have died of cold and starvation. We stayed at her place for 3days untill rain stops and road cleared. She was very joyful lady with loads of stories in store to talk on. When we entered her home she was an old wrinkled face lady who help us and by the time we left her place she was a motherly figure for us and we call her ‘Amma’. 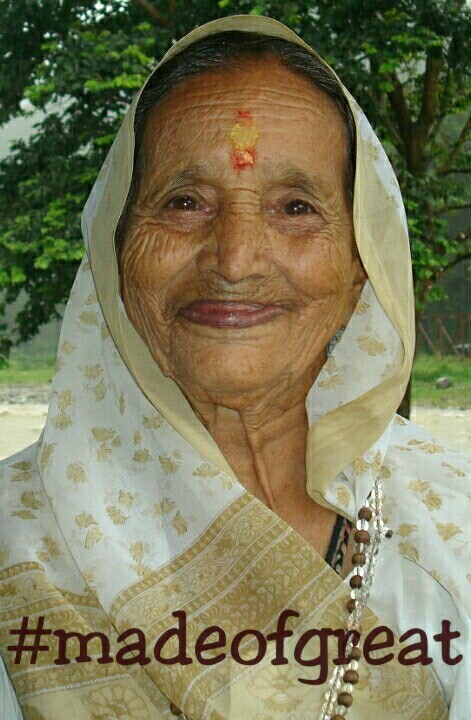 That wrinkled face, with bright eyes, never fading smile, she was much more active than us and always says a self made success story that doesn’t lead to big luxuries but loads of happiness. Today when I think of her, I feel she was definitely a Women Of Substance. A women full of power and positive influence. A women with big heart and loads of mercy. She made us realise life is about smiling and struggling together. With 3days in her motherly shelter we realised there are still people who are always ready to help. She was a synonym of Hardwork, Sacrifice, Wisdom, Trust, Support and Excellence to me. She was the women who is #madeofgreat for me. I am very thankful to Tata Motors, to take me to a trip down the memory lane in search of someone #madeofgreat I met in my life. Tata Motors is definitely pride of India. 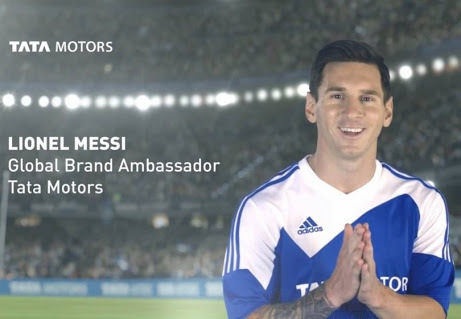 And now the alliance of Tata Motors with Lionel Messi is an example of par excellence. When pioneer like Tata Motors coaliate with the maestro of football Lionel Messi, it’s a sheer example of #madeofgreat. The one with most interesting answer will win Rs. 750/- Amazon Voucher. Winner will be selected on 26th November. Really seldom do we find such great personality. Seeing her picture radiating the glow of selfless deeds I am awed by her generosity. Kudos.A great post #madeofgreat. As to association of Lionel Messi with Tata motors I strongly opine that it's a jhinchak choice of Tata's and they will see the stars touching their feet soon. Wonderful combination. Cheers. The association of Tata Motors and Lionel Messi is indeed an amazing one.When two heroes combine together, the result will surely be extravagant. Moreover, the name of Lionel Messi will instill a lot of trust and reliability in the mind of customers for Tata Motors because Messi is a great, dedicated and hardworking sportsperson. People love and admire Messi for his single minded focus. Therefore, the collaboration will surely be very beneficial for Tata Motors. The story is heart warming . . . I had a similar experience in the garhwal mountains… i was thristy and hungry while trekking up to Nag tibba and shepherd offered me water food and place to rest. I am very much thankful to that man and your blog for reminding me of the incident. People with kind heart are very rare. It's awesome to find one in our life. The story of a Legend in herself – that’s how I will describe it in a short sentence. Very well written with the pic which enhances the simplicity yet greatness of the Lady..Salutations and very happy for you to have got inspired and bringing out the best in your life. Glad to connect with you here.. Thanks for appreciation. Being connected feels awesome. Well a very Inspiring Lady, & Amma's face beams with enlightenment. God, thanks for sending us these human gems, distinguishing humanity with real sweet Souls. Tata is a brand which was born during the struggle for India's independence, the company saw through the freedom struggle , great minds converging to think beyond & shared all those values which are still forming the core principles of the company only an employee of Tata Group Understands this feeling, they care for the employee first & help them reach those Gems In the lakhs of employees with that leadership spark, to the epitome of Success, u can see the various positions in the Tata Group. HARDWORK, Perseverance & Human Values with unrelenting focus towards Goal is what catches the Tata's attention. So Messi, was a natural partner of Tata, a rags to riches story where a boy just followed his passion not listening to the world around & kept on following his dream to become the Greatest Striker the World has ever seen in the soccer world. He never gives up Practice & doesn't have excuses to escape practice he is not under pressure, because he does what he loves the most ! GOAL……!!!! Tata's values & Messi 's perseverance makes this combination an Undefeating Duo, which make world to look towards India & boosts MAKE IN INDIA. Yogita you are born poet. Lovely poem on your Amma. Wonderful write up and the flow of whole content increase the reader curiosity to read till end. And this is one truly inspirational. Lovely ,emotional & Touchy post for Dear Amma!! Loved it Yogita ,keep writing such inspirational posts! It seems it is a wedlock of two functional bodies with similar strengths..i.e Trust ,Reliability & assurance of emerging as a winner. TATA brand name itself spreads a positive aura & by choosing Forward player Lionel Messi as Tata Motors Brand Ambassador clearly depicts their Code of conducts & signifies that something big ,reliable ,long lasting is awaited to be launched by them. Just as arrival of Messi on the ground spreads cheer amongst the fans & panic among the competition ,similar would be the future of Tata motors when they launch their products be in small medium or elite segment. All of us should say..hey wait..Tata motors is launching something with best design ,best features & best price..No competition will stand against them! Well ,that’s the trust we have in them & this amalgamation is certainly a reflection of it! An entry fit to make everyone misty eyed!